On Thursday, June 01, 2017, the pope addressed the European Federation of Catholic Family Associations (FAFCE) in celebration of its 20-year anniversary. The FAFCE represents Catholic family associations from 14 countries across Europe and has participatory status in the Council of Europe as a Non-Governmental Organization. In his morning address, Pope Francis explained the mission of the Association: the FAFCE is “called to attract others in the service of families, so that Europe can continue to consider the family its most precious treasure.” Families, the pope continued, are not pieces in a museum, but far more active and dynamic. The gift of the family is made known through openness to children and service to society. Relationships within the family as a communion of persons, the pope said, are the “driving force of true humanization and evangelization.” The family, “grounded in the inviolable dignity of the person,” is called to influence the social, economic, and political realms of life. These familial relationships can help build up a “culture of encounter” to bring about unity between generations and cultures. The Holy Father mentioned some of the present crises facing the family in Europe: demographics, migration, employment, and education. 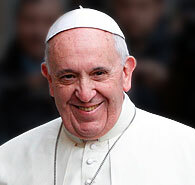 These crises, however, are not a cause for despair and discouragement, but “incentives to worker harder and better, with trust and hope.” The FAFCE works to promote economic and employment policies that favor families; the pope exhorted the members of the Association to always have “concern for showing respect and for the dignity of each person” when promoting such policies. Pope Francis emphasized a “culture of encounter,” based in dialogue, as a remedy to these hardships. Without compromising their Christianity, the Holy Father encouraged members of the FAFCE to work side-by-side with political and social leaders. To create and work in this culture of encounter, the pope encouraged families to go beyond themselves rather than remaining isolated. He emphasized the gift of “elders” of the family, who are “the permanent memory that must encourage us to employ the wisdom of the heart.” This wisdom, rooted in an understanding of the sacredness of human life, takes concrete form when human dignity is upheld through various acts of service, such as caring for orphans and the disabled and standing in solidarity with immigrants. The Holy Father concluded with encouraging the Association to “develop, with creativity, new methods and resources” to carry out a “threefold task:” supporting the younger generation, accompanying people who are traveling the “rocky roads of life,” and showing values and meanings in everyday life. Pope Francis ended his audience with a prayer to the Holy Family and entreated those present to pray for him.